Bridget Kearney and Benjamin Lazar Davis' first E.P., Bawa, was written, produced and recorded in a two week flurry of manic creativity inspired by the physical and musical environment of it's location: Accra, Ghana. Kearney and Davis set out from Brooklyn in January 2014 with little more than two guitars and a couple of phone numbers to call upon arrival. The series of happy accidents that led to them finding a teacher, an engineer, and a studio to make this music together was nothing short of miraculous. Though what led up to this outpouring started many years earlier and many miles away. Kearney and Davis first met in 2004 when both were students at The New England Conservatory and Davis was in the habit of knocking on practice room doors at random in search of potential musical partners. As Kearney sees it, this strange ritual was actually a great way for Davis to find like-minded musicians, "Ben is so insatiably creative and intuitive that the musicians who work best with him are the type that will see that about him, drop everything and go on whatever adventure he has in store." At NEC, both Davis and Kearney spent time studying West African music and dreamed of someday traveling to the source of the music to learn more. As college students and then freelance musicians starting their careers in New York City, it was hard enough to scrape together rent each month, let alone having enough left over to afford plane tickets and music lessons. 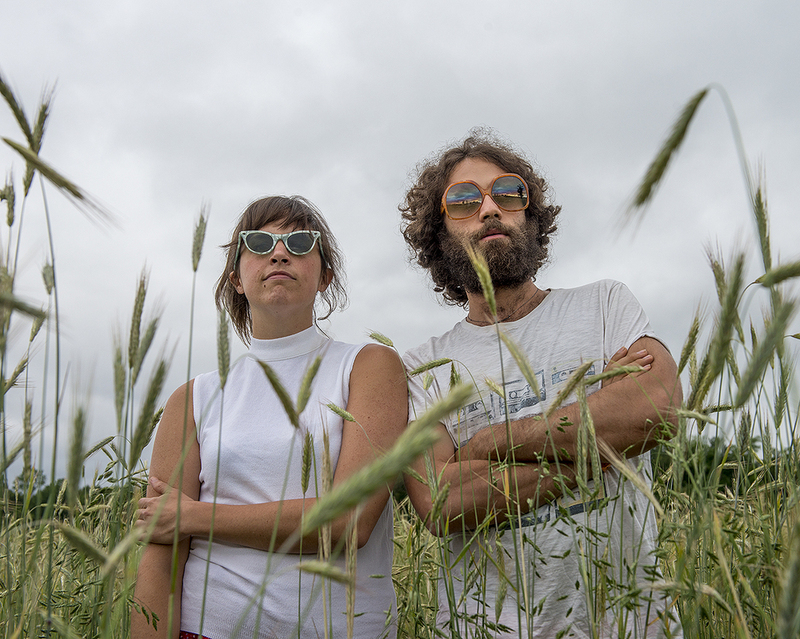 But Davis and Kearney kept the dream alive, and after saving up for a few years and developing their duo rapport playing shows around the Northeast, they were finally ready to make it happen. In January 2014, the duo set out for Accra to pursue studies there with Ghanaian musicians. Through friends in the states, they had heard of Ghanaian multi-instrumentalist Aaron Bebe. Upon arrival in Accra, they began studies with Bebe on the gyil (a Ghanaian pentatonic xylophone, with gourd resonators) and through his influence became especially enamored with Bawa music, a tradition from the Northwest region of Ghana where Bebe originally hails from. Davis explains, "There are so many different badass styles of music from Ghana, and going in we didn't know exactly which we wanted to focus on. We weren't even sure where we were gonna stay and thought we might leave Accra and check out other parts of the country. But as soon as we heard Aaron playing the Bawa stuff we were hooked and knew that we wanted to stay in Accra and study with him." Part of the Bawa tradition is writing new melodies over the long-existing song forms or "basics" as Bebe calls them. Just as there are many songs written over the American blues form, hundreds of different songs have been written using the same Bawa basics as their foundation. Finding a deep connection to what they were learning, Ben and Bridget immediately gravitated towards writing their own songs over the Bawa forms. As they began writing, luck came their way in the form of a recording opportunity. Through a chance encounter at Bebe's office at the University of Ghana, they met American guitarist and recording engineer Colter Harper, who was in the process of setting up a new studio close by. Harper invited them to come by the new Vivivi Recording Studios one afternoon and invited some Ghanaian musicians, Nana Boakye and Kofi "Alpha" Apelete Segbefia to stop by as well. Together they started laying down what would become the Bawa E.P., using the Bawa basics as a foundation and layering their own melodies and lyrics on top of them, along with a rich texture of guitars, bass, synthesizers, drums and percussion. "What Ben and Bridget were doing with the Bawa structures was really exciting to me and like nothing I'd ever heard before," says Harper "I knew they were only in the country for a few weeks, so we seized upon the opportunity to work together and they moved into the studio. We pretty much spent every hour that they weren't sleeping or studying with Aaron to work on getting the music down as they were creating it." Upon returning to the US, Kearney and Davis called upon keyboardist and producer Sam Kassirer (Josh Ritter, Lake Street Dive) to put the finishing touches on the music. "I had worked with Sam before on several different records," says Kearney, "and I just love his musicianship and thought he would be the perfect addition to this project. He's got a great talent for big picture thinking, so I knew he'd be the guy to take all of what we had recorded in Ghana, work his magic on it, put the icing on the cake and tie it all up in a nice little bundle." Bridget Kearney and Benjamin Lazar Davis' Bawa E.P. captures a unique cross-cultural collaboration, and a combination of sounds never heard together before. There is a tangible feeling of freshness and inspiration in these songs, which were composed and recorded directly in the wake of an intense period of learning music that, however foreign, resonated deeply with both musicians. In the words of Kearney, "The whole experience of making this record was so positive and affirming of our belief in music and humanity. We went out into the world as empty handed strangers and came back in three weeks with a wealth of new ideas and friendships that will last a lifetime. Why? Music. It's powerful stuff."